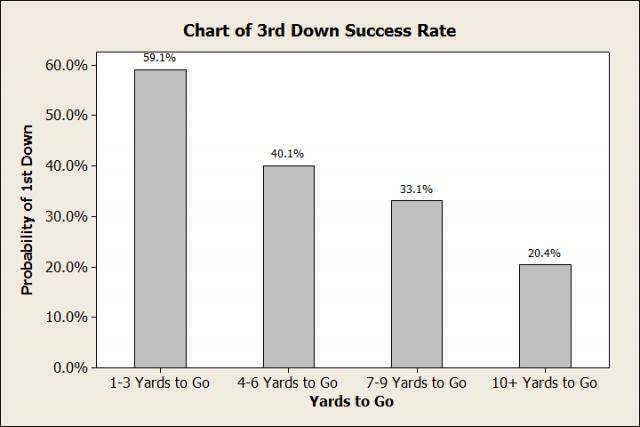 Going for It on 4th Down: Do the Statistics Say It’s a Gamble? Rutgers 6 – Princeton 4. So was the score of the first college football game, played in 1869. A lot has changed since that first game, but there is one thing that really hasn’t changed too much...punting. Whenever a team has 4th down and isn’t in field goal range, it’s almost a given that you’ll see the punt team running on the field. And O’Brien has backed up his claim too, already going for it 10 times this season. Numerous articles have come out since saying that he is going to “take more risks” and “gamble more often”. But this got me thinking, is he really taking risks? Is he really gambling? If it’s 4th and 2 at midfield, is going for it really the riskier move? The reason teams punt is because coaches assume that the farther a team is from scoring, the fewer points they’ll score. So let’s look at the distance a team has to gain to score a touchdown, and the number of points they score on average. How Important is Field Position? I went to Yahoo and used their drive log to gather play-by-play data of every game in the 2012 season that involved two BCS teams playing each other. I did only BCS games so I wouldn’t get data from lopsided games, like Oklahoma St-Savannah St. For each drive, I recorded the number of yards the team had to gain for a touchdown, and the number of points they scored on that drive. I didn’t include any drives where time expired at the end of the 1st or 2nd half. I ended up with data from 1,402 drives occurring in 59 games. You can get the worksheet and follow along here. I grouped the data into groups of 5 yards so I could calculate the average number of points scored from different yard lines. However, because there aren’t a lot of drives that start inside an opponent’s 40, I grouped those drives into groups of 10 yards. This helped increase the sample size. 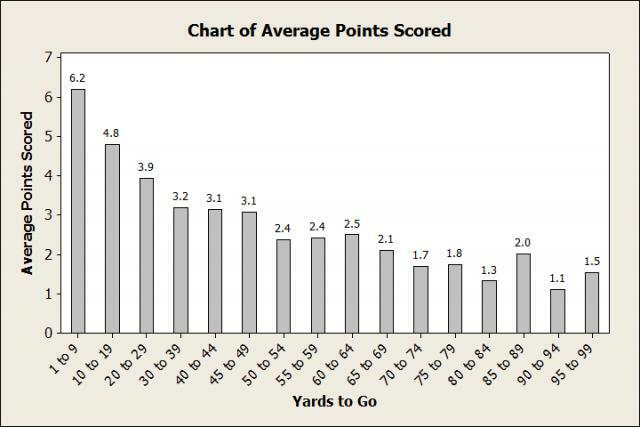 The following bar chart shows the average number of points scored for each group. No surprise, the more yards a team has to gain for a touchdown, the fewer points they score. But look...even when an opponent is inside their own 5 yard line, they are still scoring an average of 1.5 points per drive. In fact, the number of points a team scores is basically the same anywhere inside their own 30 yard line (I ran an ANOVA on those 6 groups, and found that none of the differences were statistically significant). So pinning an opponent deep in their territory might not be as rewarding as coaches think. To break it down further, let’s model the data with a regression analysis. The r-squared value tells us that 96.3% of the variation in the number of points a team will score can be explained by the number of yards they need for a touchdown. That means we can use this regression equation to help us make decision on whether to punt or not. We can plug the number of yards to go for a touchdown, and the equation will tell us the average points the team score. But we’re not quite ready to answer our question of whether to punt or not on 4th and 2 at midfield. We need to know how often we’ll get the 1st down! Time to collect more data. The bar chart below shows the percent of times NCAA teams convert on 3rd down. I used 3rd down instead of 4th because the sample size is much larger. And because teams punt so often, the goal of the team on 3rd down is the same as it is on 4th down, to move the chains in 1 play! So we can carry over the same percentages to 4th down. The statistics come from College Football Statistics and include every game played through week 3 of the 2012 season (I wasn’t able to separate games involving only 2 BCS schools). Obviously the further you have to go, the worse the odds are of getting the 1st down. Unfortunately, College Football Statistics grouped the distance into 3 yard categories. I would really like to know the percentage for each individual yardage, since 3rd and 1 will be easier to convert than 3rd and 3. Luckily, we can use regression again! 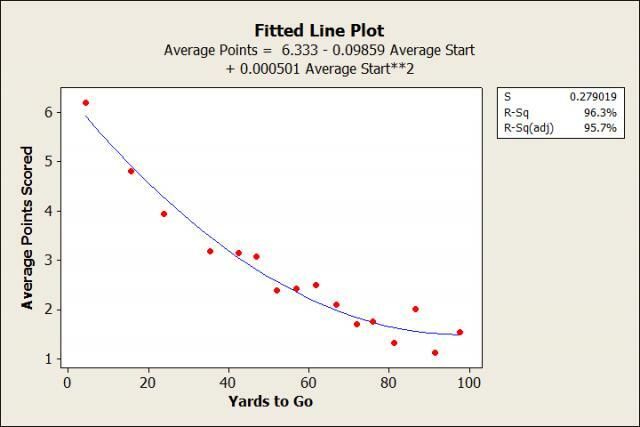 Great, now with this regression model, we can determine percentages of gaining a 1st down at individual distances. It’s not perfect, but it’ll give us a good estimate. Now we can solve our 4th and 2 from midfield problem! Let’s assume we’ll get the first down 58.2% of the time. So on average, how many points can we expect to score by going for it? Using the table with the probabilities of getting a 1st down, we should go for it on 4th and 10 or less. And this is assuming we pin them at the 1 yard line! So using the same method, we can create a cheat sheet of when a coach should decide to go for it. Instead of doing a decision for every yard line, I’m going to use the groups of 5 and 10 yards from earlier. 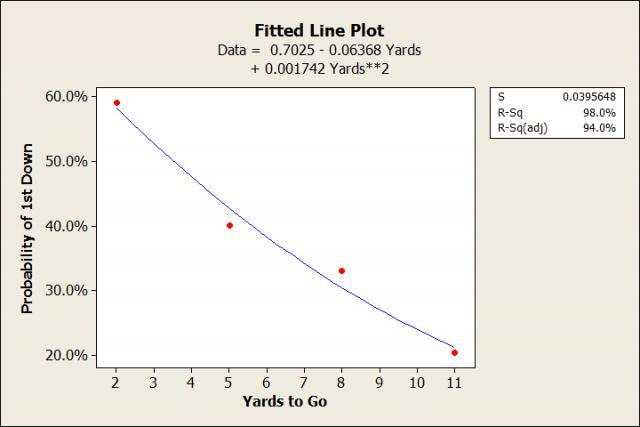 Calculations are based on the middle yard line and assume you get exactly that yardage needed. According to espn.com, the average punt nets 37.5 yards. 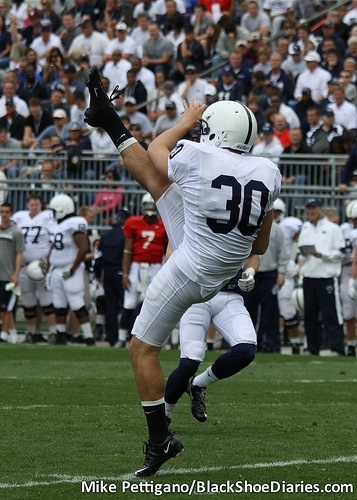 Penn State’s punts are well below that average, netting 32.1 yards. Houston is tops in the nation, netting 47.6 yards per punt. So I’ll make a decision assuming the punt would travel all 3 of those distances. Decisions in italics assume the punt was downed at the 1 yard line. Warning: You’re going to think this table is absolutely ridiculous. Ok, I knew this data analysis was going to say coaches should be more aggressive on 4th down, but I never thought it would say they should be this aggressive! What is going on? Going for it on 4th and 7 from your own 5 yard line is insane...right? Well, yeah, it seems like it. If you don’t get it, the other team will score an average of 5.8 points, almost a free touchdown. But the thing is, if you boot a 32 yard punt, the other team still gets the ball at your own 37. With that great field position, they will score an average of 3.4 points. You’re kind of stuck either way. So even though the odds of converting a 4th and 7 are slim (about 1 in 3), the statistics say the reward of not giving up possession is worth the risk. And I think that’s the key takeaway in all of this, not giving up possession. With teams able to score from anywhere on the field, it is no longer a game of field position. Rather, it’s a game of possessions, and attempting to keep possession of the ball is worth sacrificing field position when you fail. I think the following statistics sums it up pretty well. So far this season, in games between BCS schools, there have been 70 drives that have started inside the 5 yard line. In those 70 drives there have been 14 touchdowns (20%) and just one safety (1.4%). And on top of that, the average yards gained on those 70 drives is 42! Even when you pin a team inside the 5, they’re usually getting back to midfield! Like I said, it’s no longer a game of field position. But do I really think every coach should be going for it on 4th and 4 no matter where they are on the field? Do I really think Bill O’Brien should be going for it on every 4th and 7? No, I don’t. The table above was just meant to form a general idea based on averages from this season. It’s not meant to be absolute fact. And there are other factors it doesn't account for (time, score, quality of your offense and defense). But keep in mind the table assumes you pick up only the exact yardage needed for the first down. When you consider you could gain more yards, the argument for going for it is strengthened even more. The table might be a little too aggressive, but it definitely shows that coaches are punting way too much. Photograph by Mike Pettigano. Licensed under Creative Commons BY-NC-ND 2.0.